This still life is probably one of the only signed paintings by Flemish flower painter Maria-Theresia van Thielen. It is truly a jewel of the collection! Maria-Theresia van Thielen was one of three daughters of flower painter Jan Philips van Thielen. Her two sisters also became painters. 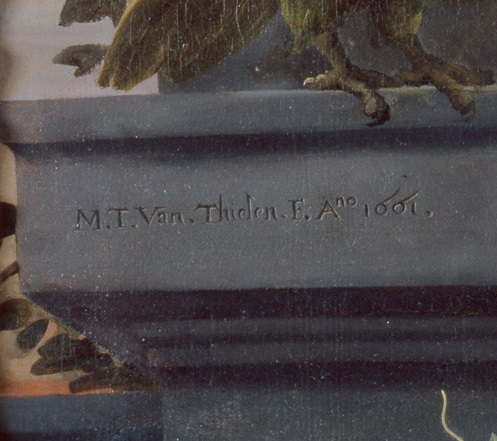 The skillful and interesting composition of our painting sets it apart from most flower paintings by the van Thielen family; this may be why Maria-Theresia prominently signed it here on the pillar. There you can see “M.T. von Thielen” along with F. (for fecit, which is Latin for “made in”), Ano (short for Anno Domini, or A.D.) and the year, 1661. The gray stone of the column and urn beautifully set off the rich colors and careful details of the parrot, flowers, and fruit. The tendrils of the grapevine, nasturtium, and morning glory are rhythmic and delicate. Flower paintings such as these were a specialty of painters in the Netherlands during the 17th century. They capture the fleeting beauty of the natural world and the enjoyment it can give. Also, it reminded the viewer that human life is transient. Paintings like this combine natural materials that are at their peak at different times in the year—seemingly real, but those who were well-educated would know that it is a complete construction. Giving the painting a truely exotic touch is the parrot. His coloring—rich green with red splashes on his wings and a yellow face—adds to the colorful array of the fruit and flowers. Also, the curve of his wings and tip of the head mimic the curves in the rest of the painting. The parrot, of course, is not native to northern Europe and would have been owned by someone of means. The upper classes loved these birds not only for their color and rarity, but also because of their ability to mimic humans. 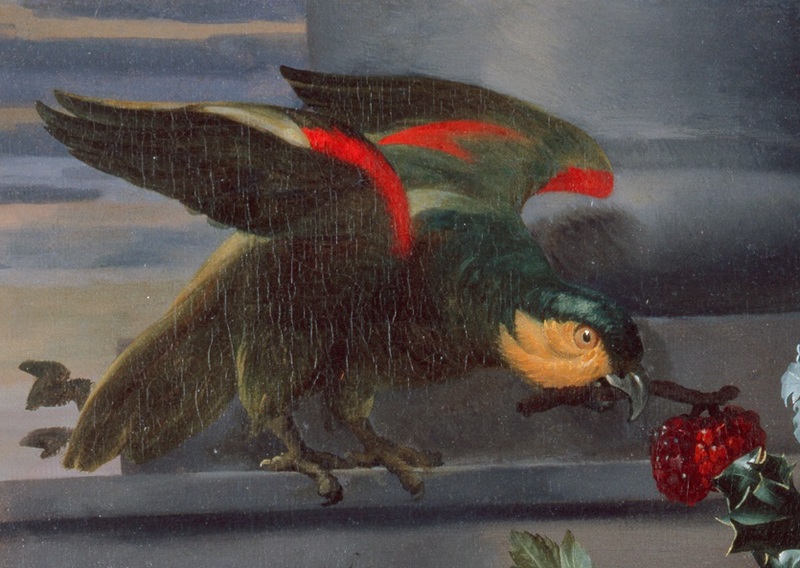 Parrots were included in northern still life paintings just as other objects were: they were a symbol of economic power and visual extravagance. It is not a coincidence that the most flamboyant and expensive tulips were called parrot tulips. The parrot is holding a short branch with two raspberries on it. This is probably a reference to a classical story related by Pliny the Elder about the Greek painter Zeuxis. Zeuxis’s painting of grapes was so realistic looking that the birds flew at them in order to eat them. Not only would this be an allusion that would appeal to the well-educated owner of the painting, it is a reflection of van Thielen’s belief in her skill as an artist. I think it’s a very apt comparison, don’t you? 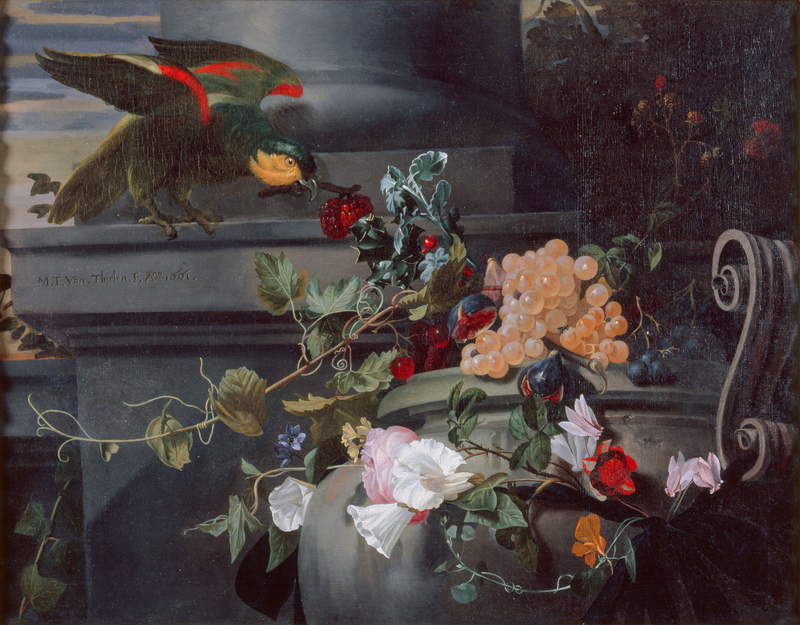 This entry was posted in Art, Curatorial and tagged european painting, maria-theresia thielen, Northern Baroque, parrot, still life, thielen. Bookmark the permalink.